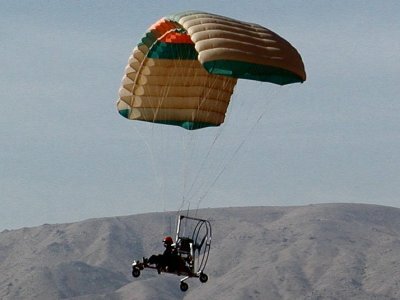 The development of the first mass-produced powered parachute took approximately two and one-half years. Aeronautical Engineer Steve Snyder was implementing and perfecting the use of square ram-air parachutes which had properties of a lifting wing, he found that increased glide ratios were developed. He therefore assumed that if the person or payload suspended under the chute had some thrust added, the distance traveled could be extended. With more power, it could fly level or even climb. He then decided to pursue this idea with the objective of creating a safe and simple aircraft that even amateurs could fly easily. This was the start of the birth of Paraplanes. 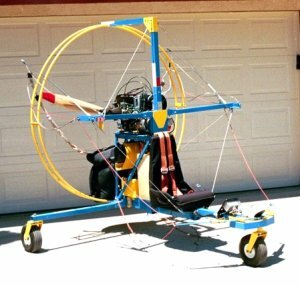 With the help of Adrian Vandenberg, who had expertise in metalworking and machining, he completed the first basic paraplane powered parachute frame design in March of 1981. Daniel Thompson, a small engine expert, was brought on to the project three months later to produce a power plant for the paraplane. He fitted the paraplane aircraft with two small Chrysler engines and the P-1 (prototype 1) was born. On the first day of test flying, attempts were made to get the paraplane powered parachute aircraft off the ground. Steve, at 150 lbs., finally tried easing the power away from full throttle at take-off, and managed to fly the powered parachute craft to a height of 40 to 50 feet. He had a difficult time with control of the powered parachute craft because of the torque produced by both engines spinning their propellers in the same direction. The total flight time was 30 - 35 seconds at a speed of 20 to 25 mph. The P-1 flew more than 10 times, once by a woman weighing 110 lbs., which allowed for better performance of the test flights. Many revisions were made during those test flights, including the addition of a vertical stabilizer, flaps, ailerons, and optimizing the parachute trim. Ram air parachutes of the day had a flat profile and offered limited control. More anhedral (downward curve) and ribs were added to the chute ultimately giving the powered parachute craft more stability and pressurization on the P-1's parachute thus solving the control issue. While the parachute control solutions were being worked out, Dan came up with an improved airframe design for the paraplane, and with Steve's idea of folding landing gear for portability, the P-2 was completed in January of 1983. The problem of torque was also solved by having the propellers counter-rotating, thus canceling out each other's torque effect. Three months later the P-3 made its debut at the Sun & Fun Airshow in Florida. Response was overwhelming, and the ParaPlane Corporation was formed to produce the portable, safe, and easy to operate powered parachute Paraplane aircraft the P-3 had proven itself to be. This was the birth of Powered Parachutes, and many innovations and improvements have come from these humble beginnings since then. (c) Copyright 1996-2014, Inland Paraflite, Inc. All rights reserved.